Life in the Trumpocene: "We want to make our products here?" In a meeting with business leaders this morning, Trump reiterated his goal of bringing manufacturing "back" to America. "We want to make our products here," he stated. The President seems determined to implement policies he feels will bring this about, through a program of massive deregulation and one or another kind of import tariffs. These are in line with major campaign promises. Increasing jobs in the U.S. is a laudable goal. But many would feel better about this if Mr. Trump were an economist, or himself knew something about manufacturing and trade in the 21st century, or had appointed people with such expertise to his cabinet. Sadly, no such expertise is in evidence. There's a certain kind of logic here, albeit vague. In theory, just the right mix of import duties and eliminated regulations could increase manufacturing jobs in the United States. But the scenarios with that outcome would also tend to reduce workers' wages and increase environmental pollution. While that would also tend to make U.S. goods affordable worldwide, retaliatory import tariffs by other countries could easily cancel that out. The administration seems to be under the sway of a number of myths, a few of which are explored below. MYTH#1: "Burdensome" regulations were invented out of thin air by ivory-tower intellectuals. One can argue any particular regulation endlessly, but the fact is that many regulations placed on manufacturing and other business activities have arisen from experience and necessity. Such regulations include things like minimum wage laws, workplace safety regulations, fines for environmental contamination, honesty in advertising, and warranties of product fitness. The elimination of "70 to 80 percent" of existing regulations (Trump's words), will have consequences to businesses and to the well-being of most Americans. MYTH#2: There are millions of good manufacturing jobs out there waiting to "return" to the United States. The "offshoring" of manufacturing certainly has moved jobs out of the U.S. and into other countries. But it is important to remember that at the same time both the productivity of manufacturing workers and the skills they need have dramatically risen worldwide. A factory that once needed thousands of minimally skilled workers today needs a few hundred workers with significantly greater technical skills. The result is that returning manufacturing operations to the United States will never recreate anywhere near the same number or kinds of jobs that existed here as recently as the 1960s. MYTH #3: There is such a thing as "manufactured here" in the 21st century. The chart illustrates the supply chain for a relatively simple and inexpensive product, tennis balls used at Wimbledon. It shows that ten different countries are involved. Wool from New Zealand is shipped to the U.K. where it is turned into felt weaving that is shipped to the Philippines. Also shipped to the factory in the Philippines are clay from the U.S., silica from Greece, petroleum byproducts from China, sulfur from South Korea, zinc oxide from Thailand, and more. 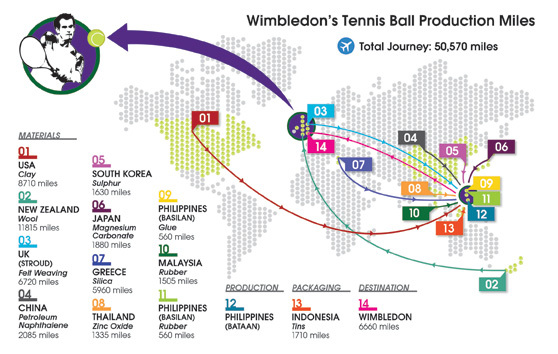 These materials are formed into tennis balls in the Philippines, then go to Indonesia for packaging in the familiar tins, and these are then sent to Wimbledon. Companies do this because it is cost-effective, resulting in a final product that is price-competitive in a given market. The cost factors that accumulate through the supply chain are many, including the wages and benefits of different kinds of workers in different countries, environmental protections and worker safety regulations, import duties, taxes, and transportation costs. Yet the total costs remain low to a degree that probably could not be achieved by a single business operating within a single country. Tinkering with these systems is one thing. A major revamp, executed by people with limited understanding of how things really work, is terrifying. A critical consideration is that both regulations and multi-national supply chains have tended to develop organically, rather than through big-picture planning. That is, each regulation has tended to arise in response to a real-world problem at a particular place and time, and each step in a supply chain has tended to develop from the immediate needs of one particular part of the system, without regard to other steps or players. The risks of allowing amateurs to attempt a deliberate reorganization of the entire system are high.